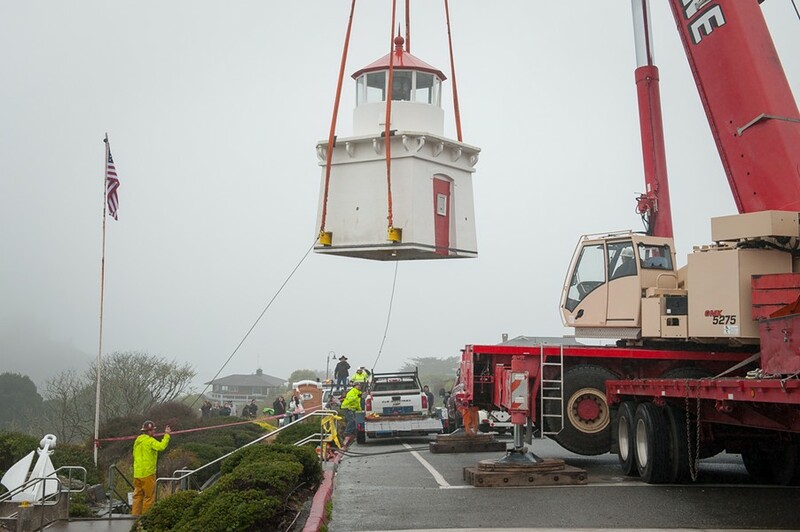 Two workers use ropes to align the lighthouse as it is moved to a trailer. 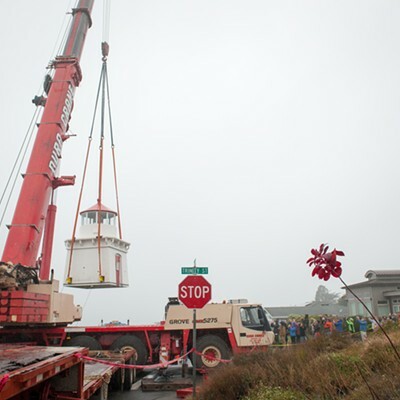 After several hours of staging and prep, and thanks to several weeks of negotiations, protests and meetings that capped nearly a year of handwringing about how and where to move the Trinidad Memorial Lighthouse before the crumbling cliff dumped it into the ocean, a giant crane delivered the monument safely to a truckbed so it can go to its new, temporary home below Trinidad Head. 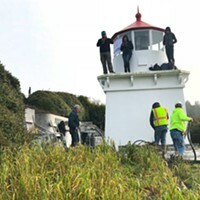 The move was announced yesterday evening in a press release from the Trinidad Civic Club, which said the Cher-Ae Indian Community of the Trinidad Rancheria, the Trinidad Civic Club and the Yurok Tribe had reached consensus on a location for the embattled mini-lighthouse. 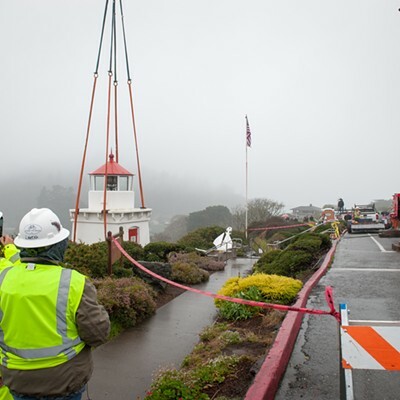 Controversy about its relocation has swirled for more than a month when, in early December, the Civic Club announced it was going to move the lighthouse about 20 feet to the east as a stop-gap measure. The memorial has sat at its current location — at the end of Trinidad's main drag – since 1949 and contains the original lens from the Trinidad Head Lighthouse. But its physical location has an even weightier history, as a traditional Yurok village site and final resting place for Yurok funerary remains. The lighthouse's presence on the site, protesters insisted, was intolerable to begin with and the proposed shift to the east would be a further disruption. 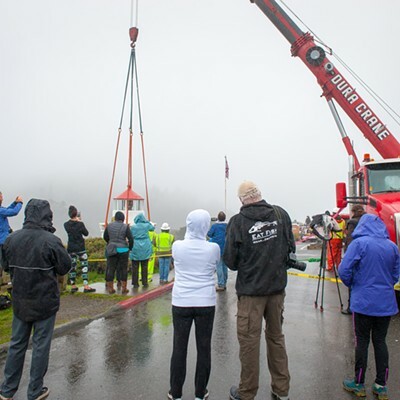 Protesters stayed onsite for 12 days holding signs and hoisting the Yurok flag. 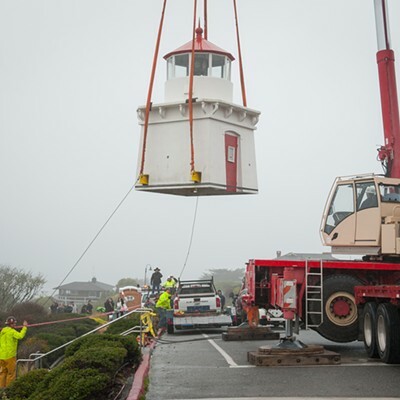 Ultimately the Trinidad Rancheria agreed to stage the lighthouse and accompanying bell at its harbor property, close to the Seascape Restaurant at the bottom of Trinidad Head, until a new, permanent location can be found. 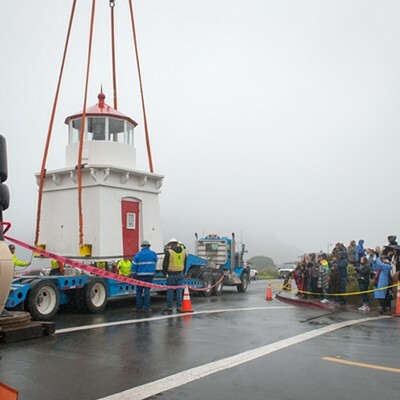 Scores of community members arrived at the foot of Trinity Street at around 8 a.m. as crews began preparing the lighthouse for transport. 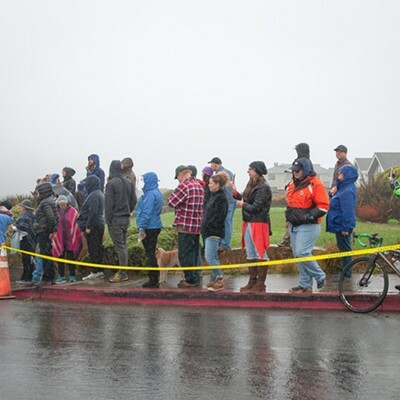 The Humboldt County Sheriff's Office sent a deputy to monitor the situation, but most people heeded the caution tape strung around the site. The mood was largely positive. "To me, it's common sense," said Dave Chism, a Westhaven resident who grew up in Trinidad. "If you have a chance to straighten it out, straighten it out." Patti Fleschner, president of the Trinidad Library and chair of the Civic Club, went around gathering names for thank you letters. Rain began to fall in the late morning, but the crowd only grew, swelled by the presence of most of Trinidad Elementary School. Thomas Joseph II, one of the original protesters at the site, delivered a live feed to his Facebook audience as the crane operator arrived. 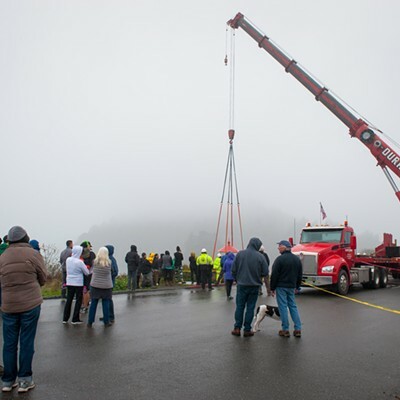 It was after noon when the crane finally began to lift the structure from the site, prompting several whoops from attendees. There didn't appear to be any structural damage to the lighthouse or the lens as some had feared. 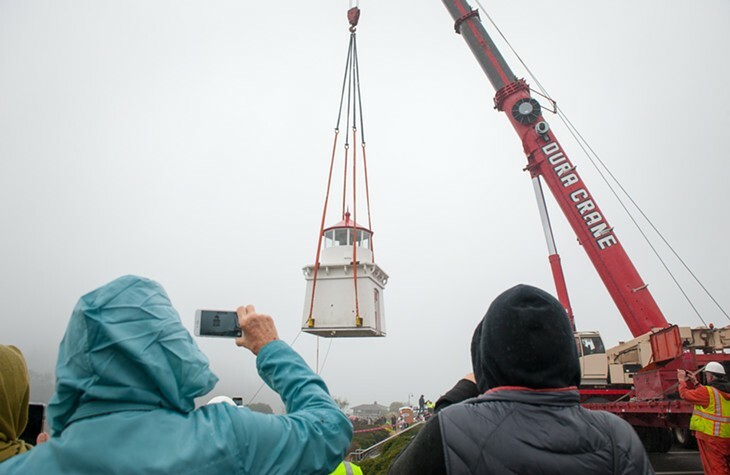 According to the press release, "The Memorial Lighthouse, Bell, and the plaques commemorating those buried or lost at sea will be moved to a permanent location once the appropriate permitting process is completed and a final location identified." 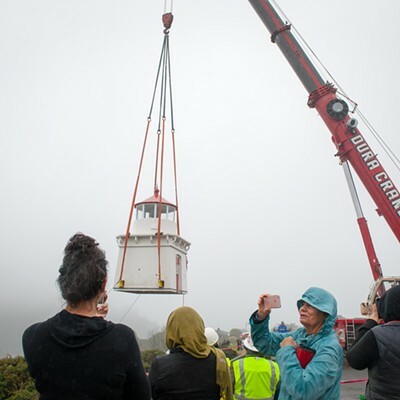 The Cher-Ae Indian Community of the Trinidad Rancheria, the Trinidad Civic Club and the Yurok Tribe have agreed to a new temporary location for the Trinidad Memorial Lighthouse and Bell. Over the course of multiple meetings, the above-listed organizations developed a plan to move the monument, which stood for almost 70 years on Civic Club Property in the City of Trinidad above the historic Tsurai Village Site. 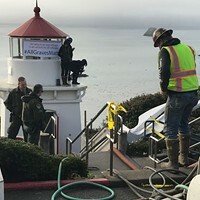 In mid 2017, Trinidad Civic Club was notified that the Lighthouse was in danger of sliding from its current location on the bluffs overlooking Trinidad Bay. If the steep slope had completely failed it could have done damage to portions of the Tsurai Study Area below. On January 5, 2018, the stakeholders arrived at consensus regarding the lighthouse’s temporary relocation. The parties agreed to move the monument from the Civic Club Property to the Trinidad Rancheria Harbor Property, where it will be staged until a permanent location is identified. Parallel to the settlement discussions, a large group of Native and non-Native citizens advocated for the protection of the village and funerary remains by occupying the site for 12 days. The Tsurai village is one of the largest traditional Yurok village sites. The natural harbor created by Trinidad Head offered access to abundant marine resources as well as ample opportunities to conduct commerce with other coastal villages and tribes. The Trinidad Memorial Lighthouse, erected in 1949, contains a lens from the original Trinidad Head Lighthouse, which was built in 1871. 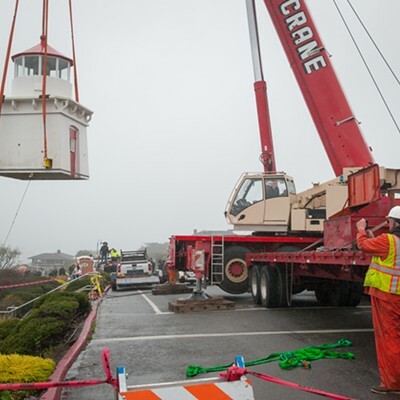 The Memorial Lighthouse and Bell will be relocated prior to the end of January 2018. 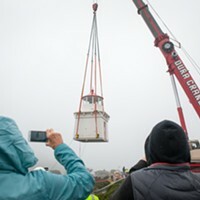 The Memorial Lighthouse, Bell, and the plaques commemorating those buried or lost at sea will be moved to a permanent location once the appropriate permitting process is completed and a final location identified.